In this study, stress tolerance devices consisting of heat shock protein (HSP) genes from thermophiles Geobacillus and Parageobacillus were introduced into riboflavin-producing strain Bacillus subtilis 446 to improve its stress tolerance and riboflavin production. 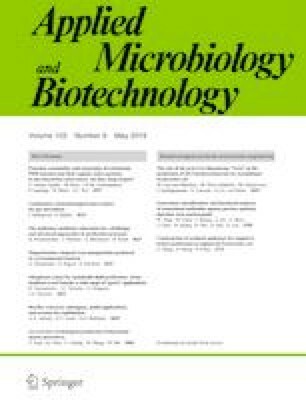 The 12 HSP homologs were selected from 28 Geobacillus and Parageobacillus genomes according to their sequence clustering and phylogenetically analysis which represents the diversity of HSPs from thermophilic bacillus. The 12 HSP genes and 2 combinations of them (PtdnaK-PtdnaJ-PtgrpE and PtgroeL-PtgroeS) were heterologously expressed in B. subtilis 446 under the control of a strong constitutive promoter P43. Most of the 14 engineered strains showed increased cell density at 44 to 48 °C and less cell death at 50 °C compared with the control strains. Among them, strains B.s446-HSP20-3, B.s446-HSP20-2, and B.s446-PtDnaK-PtDnaJ-PtGrpE increased their cell densities over 25% at 44 to 48 °C. They also showed 5-, 4-, and 4-fold improved cell survivals after the 10-h heat shock treatment at 50 °C, respectively. These three strains also showed reduced cell death rates under osmotic stress of 10% NaCl, indicating that the introduction of HSPs improved not only the heat tolerance of B. subtilis 446 but also its osmotic tolerance. Fermentation of these three strains at higher temperatures of 39 and 43 °C showed 23–66% improved riboflavin titers, as well as 24-h shortened fermentation period. These results indicated that implanting HSPs from thermophiles to B. subtilis 446 would be an efficient approach to improve its stress tolerance and riboflavin production. The online version of this article ( https://doi.org/10.1007/s00253-019-09788-x) contains supplementary material, which is available to authorized users. We dedicate this paper to and in memory of our beloved friend, supervisor and colleague, Prof. Keqian Yang, who devoted his life to Streptomyces physiology, antibiotic biosynthesis, and molecular regulation. We are grateful to Professor Yong Tao for the gift of plasmid pDB1s.